Buddhism in Japan | What is Buddhism? I would like to introduce you Buddhism, one of Japanese major religions in this page. From ancient time, there has been a thought of syncretization of Shinto and Buddhism in Japan, so you may find Shinto elements in Buddhist Temple and vice versa. Please remind it when you visit Buddhist Temple. The origin of Buddhism is in India in 5th century B.C. The biggest difference from other religion is that Buddhism does not believe in God. The principle of Buddhism consists of two axises. They define the world where all the living being live as 'Seken' and one principle is how to live in Seken and the other is how to overcome Seken and reach to enlightenment. You can reach to the enlightenment by the right understanding and insight of the truth. The basic idea is 'the logic of cause and effect'. They think that all the acts bring the results, and acts are divided into good and bad by the results. Then it encourages the people good act. All the living beings continue the reincarnation by the bad acts when they lived, but if you reach to the enlightenment, you will get rid of reincarnation. Buddhism was brought to Japan via China and Korea in 6th century. At first there was a conflict with Japanese traditional Shinto. But in about 8th century, by the cyncretization idea Shinto and Buddhism reconciled. By this thought, all the Gods are impersonated by Buddha. The initial purpose of introducing Buddhism was the peace of the nation, but after 13th century it was popularized. In 19th century, after returning the power back to the Emperor, Shinto became more important. By the order of the government 'Separation of Shinto and Buddhism' many Temples were destroyed. Nowadays, most of Japanese people don't distinguish Shinto and Buddhism and go to worship for both institute. Only the funeral is operated in Buddhism style. When we call 'Jiin', it also indicates the institutes of other religions. If you want to limit the word to Buddhist Temple, you should call 'Otera'. The constructions of the temple are divided into 'Doto (pagoda)' where worship object is enshrined, and 'Sobo' where monks live. 'Doto' means the tomb of Buddha and original shape was upside-down bowl, but they started to put up a parasol to avoid the sunshine and then the shape became pagoda in China. Chinese style was introduced Japan and tow-storied pagodas which remained the look of upside-down bowl were built. Three-storied and five storied pagodas, and stone pagoda in Japanese garden came from the same origin. Most of the local small Temples have near-by supporters and own and manage their burial ground. These Temples normally close the doors other than supporters not like Shrine. 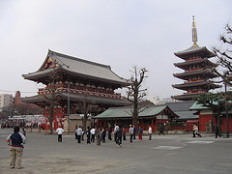 On the other hand, famous Temples in Nara and Kyoto open the door widely for worshipers and tourists. Now there are about 75,000 Temples and the number of Buddhist sculptures is about 300,000. But please remind that some Temples are not clearly distinguished from Shrine by the influence of cyncretization. Some Temples have Shrines (Jinguji) and some Shrines enshurine Buddha (Gongen). Followings are the representative architectual styles of Temple. Architectual style of Chinese Temple which used to be adopted mainly to the Zen sect Temple. Chinese architectual style which used to be adopted to Great Buddha hall. Architectual style used for the noble houses in Heian era (9-12th century). Shiden (main hall) was built facing the south garden accompanied with annex buildings on the east and west sides. These buidings were jointed with Wataridono (passing hall). Two annexes have each Wataridono to the south and put fishing hall at the end. Architectual style used for the warriors houses in Muromachi era (14-16th century). Post and beam structure. Inside of the house was divided by sliding doors and walls. Put ceiling plate. Decorate the guest room with Tokonoma (alcove), uneven shelves, Tsukeshoin (small shelve by alcove), etc. The space is divided into guest area and living area.